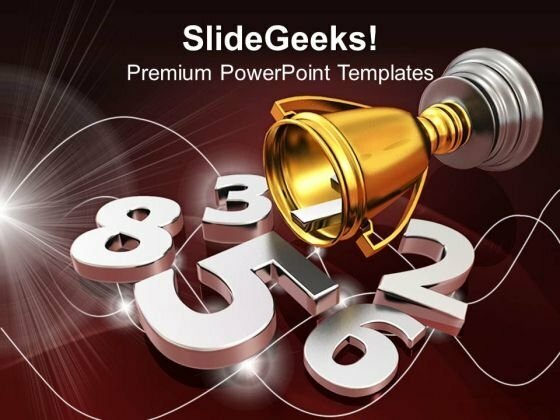 Award Winning Competition PowerPoint Templates And PowerPoint Themes 1012-Visually support your Microsoft office PPT Presentation with our above template illustrating an overturned golden trophy with an assortment of metallic numbers spilling out of it. This image represents the concept of competition and winner. The structure of our templates allows you to effectively highlight the key issues concerning the growth of your business. Create captivating presentations to deliver comparative and weighted arguments.-Award Winning Competition PowerPoint Templates And PowerPoint Themes 1012-This PowerPoint template can be used for presentations relating to-"Winning a gold trophy, competition, lifestyle, business, winners podium, success" Our Award Winning Competition PowerPoint Templates And PowerPoint Themes 1012 get the audience to accept your credentials. They will acknowledge your professional acumen. Expose your audience to high quality. Our Award Winning Competition PowerPoint Templates And PowerPoint Themes 1012 are a befitting example.